The λ Red recombineering technology has been used extensively in Escherichia coli and Salmonella typhimurium for easy PCR-mediated generation of deletion mutants, but less so in pathogenic species of E. coli such as EHEC and EPEC. Our early experiments with the use of λ Red in EHEC and EPEC have led to sporadic results, leading to the present study to identify factors that might improve the efficiency of Red recombineering in these pathogenic strains of E. coli. In this report, we have identified conditions that optimize the use of λ Red for recombineering in EHEC and EPEC. Using plasmids that contain a Ptac-red-gam operon and a temperature-sensitive origin of replication, we have generated multiple mutations (both marked and unmarked) in known virulence genes. In addition, we have easily deleted five O157-specific islands (O-islands) of EHEC suspected of containing virulence factors. We have examined the use of both PCR-generated substrates (40 bp of flanking homology) and plasmid-derived substrates (~1 kb of flanking homology); both work well and each have their own advantages. The establishment of the hyper-rec phenotype requires only a 20 minute IPTG induction period of red and gam. This recombinogenic window is important as constitutive expression of red and gam induces a 10-fold increase in spontaneous resistance to rifampicin. Other factors such as the orientation of the drug marker in recombination substrates and heat shock effects also play roles in the success of Red-mediated recombination in EHEC and EPEC. The λ Red recombineering technology has been optimized for use in pathogenic species of E. coli, namely EHEC and EPEC. As demonstration of this technology, five O-islands of EHEC were easily and precisely deleted from the chromosome by electroporation with PCR-generated substrates containing drug markers flanked with 40 bp of target DNA. These results should encourage the use of λ Red recombineering in these and other strains of pathogenic bacteria for faster identification of virulence factors and the speedy generation of bacterial mutants for vaccine development. A new method for engineering bacterial chromosomes has emerged in recent years that takes advantage of the high proficiency of bacteriophage recombination systems acting on linear DNA substrates [see reference  for review]. The λ Red recombination system, consisting of Bet (a ssDNA annealing protein) and Exo (a 5'-3' dsDNA exonuclease) promotes gene replacement of electroporated linear DNA substrates into the Escherichia coli K-12 chromosome at a very high efficiency [2–5]. Inactivation of host RecBCD exonuclease activity, either by mutation or production of the anti-RecBCD Gam function, is required for efficient Red-promoted recombination with linear dsDNA substrates . Zhang and co-workers , using the E. coli rac prophage RecET recombination system, recognized that PCR-generated substrates with as little as 40 bp of homology could serve as efficient substrates for gene replacement in E. coli. The use of such substrates has also been demonstrated with the λ Red system, with Red and Gam being supplied from either a prophage , a low-copy number plasmid , or from a ΔrecBCD::Ptac-gam-red chromosomal substitution [unpublished observations]. The high efficiency of Red and RecET-promoted recombination with such short regions of homology has allowed E. coli geneticists to perform oligo-directed gene replacements that yeast geneticists have performed for years [7–9]. The establishment of a hyper-recombinogenic phenotype in E. coli K-12 by expression of plasmid-encoded Red and Gam in vivo suggested that the system might easily be adapted for use in other bacterial strains. In fact, many labs have reported the use of λ Red for making PCR-generated gene knock-outs in Salmonella enterica Serovar typhimurium [10–16] and Salmonella enterica Serovar enteritidis . λ Red has also been used for epitope tagging of chromosomal genes in Salmonella enterica . Day and co-workers have used λ Red for generating a dsbD::ery substitution in Shigella flexneri . Recently, Derbise et al  have used Red to promote gene replacement in Yersinia pseudotuberculosis, though the efficiency with PCR substrates containing short regions of homology was successful for only one out of three loci tested. Pathogenic E. coli species should also be amenable to the use of λ Red for chromosomal engineering. Enterohemorrhagic E. coli O157:H7 (EHEC) and enteropathogenic E. coli (EPEC) are members of the attaching and effacing (AE) family of enteric pathogens [21, 22]. These pathogens bind tightly to the intestinal epithelium and cause localized effacement of micovilli, followed by alteration of the cytoskeleton beneath sites of bacterial attachment. 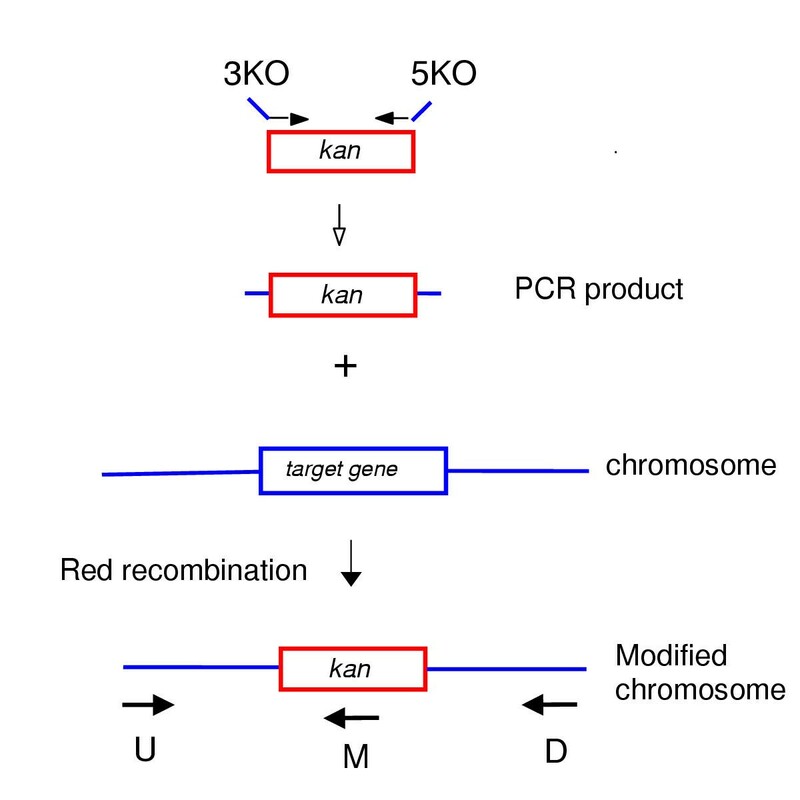 Some labs have used λ Red to promote gene knockouts in EPEC by recombination between linear plasmid DNA fragments containing long regions of homology (~0.5 – 1 kb) and the EPEC chromosome [23–25]. In addition, a few reports have utilized PCR substrates containing short regions of homology to perform gene replacement in EHEC [26–28], the latter report employing plasmids and protocols described herein. None of these reports, however, described the frequency of recombinant formation or the reproducibility of Red-promoted PCR-mediated recombination in EHEC at multiple loci. Indeed, our initial attempts to employ λ Red for PCR-mediated gene replacement at various loci in EHEC in EPEC were met with sporadic success, similar to the limited success seen with Red-promoted short homology recombination in Y. pseudotuberculosis. These difficulties prompted us to examine more closely the methodologies of λ Red promoted PCR-mediated gene replacement, especially in regard to optimizing its use in EHEC and EPEC. In this report, we have found conditions that allowed us to reproducibly obtain PCR-mediated recombinants using λ Red recombination in EHEC and EPEC, guidelines that might also apply to the use of Red in other pathogenic bacteria. These steps include the use of an optimal buffer for the preparation of electrocompetent cells, a heat-shock step that induces higher frequencies of gene replacement, and proper positioning of the drug marker within the recombinant PCR substrate. As demonstration of the utility of this technology, five EHEC O-islands were easily deleted from the EHEC chromosome by simple electroporation with PCR-generated substrates. We also have noted the importance of limiting expression of Red functions during growth of EHEC, as extended expression of the recombination functions induces a 10-fold increase in spontaneous mutagenesis. Finally, we report gene replacement frequencies generated by various treatments of plasmid substrates to construct marked and precise deletions of EHEC eae, tir, and the eae-cesT-tir operon. Red-promoted gene replacement using PCR derived substrates is diagrammed in Figure 1. Typically, PCR is performed with two primers (60 mers) which contain 20 bases at the 3' ends to amplify a drug marker. In addition, the primers contain 40 bases at the 5' ends that are complimentary to either the upstream or downstream regions of the target gene (see Figure 1). The PCR product, which has the drug marker flanked by 40 bases upstream and downstream of the targeted gene of interest, is simply electroporated into Red + Gam producing E. coli or Salmonella. This strategy has been shown to promote high efficiency gene replacement with such substrates in E. coli K-12 [4, 5], as well as Salmonella species (see Background). Schematic of λ Red-promoted PCR-mediated recombination. PCR products, containing a drug marker flanked by 40–60 bp of target DNA, are generated by primers designated 5KO and 3KO (see Table 6 in Additional file #2) and electroporated into EHEC containing pKM201 or pKM208 (or EPEC containing pTP223). Chromosomal replacements were verified by PCR using primers upstream (U), downstream (D) and within the drug marker (M) (data not shown). We have previously shown that a Red + Gam-producing plasmid (pTP223) promotes gene replacement efficiently with substrates containing long regions of homology to the target gene [2, 3]. On the other hand, PCR substrates containing short regions of homology (40–60 bp) recombine at very low frequency when Red and Gam are supplied by multi-copy plasmid pTP223 [reference ; unpublished observations]. We and others have noted that expression of red from the chromosome (or low copy number plasmids) is better suited for Red-promoted recombination [2, 4, 5]. It is assumed that since Red induces the rolling circle mode of replication in medium or high copy number plasmids , linear multimers of the plasmid are generated that may compete with the electroporated substrates for the Red recombination functions. This reasoning explains why pTP223, while expressing high levels of Red and Gam, is not optimal for Red-promoted gene replacement in E. coli K-12. In addition, studies in our lab with ΔrecBCD::gam-red chromosomal substitutions (i.e., no resident plasmid), expressing red from either Plac or the stronger Ptac promoter, have shown that Red-promoted recombination with short-homology substrates requires higher level expression of the red functions relative to long-homology substrates [unpublished observations]. This observation explains why pTP223 works well with long homology substrates, but not well with short homology substrates: the limited amount of "free" Red functions when expressed from pTP223 is adequate for long homology substrates, but not for PCR (short homology) substrates. A construct that meets both these requirements (high expression from a single or low copy number replisome) is plasmid pKD46, described by Datsenko and Wanner  which uses the pBAD promoter to express red and gam from a low copy number temperature-sensitive replicon. A similar plasmid was constructed in our lab, except that gam and red are driven by the Ptac promoter (pKM201). A variation of pKM201 was constructed which expresses the lacI repressor gene (pKM208) in order to keep expression of red and gam under tight control prior to IPTG induction. In anticipation of the requirement to easily remove these plasmids after gene replacement, both plasmids contain temperature-sensitive origins of replication. EHEC containing pTP223, pKM201, or pKM208 were electroporated with a PCR substrate containing the kan gene flanked by 40 bases from the 5' and 3' regions of the lacZ gene, using an optimized protocol scheme for preparation of electrocompetence cells as described in the Methods section. Recombinants were detected as white KanR colonies on LB-kan plates containing X-gal and IPTG, as previously described . As expected, plasmid pTP223 was unable to efficiently promote short-homology recombination in EHEC (data not shown; however, see results with EPEC below). On the contrary, low copy number plasmids pKM201 and pKM208 were able to promote short homology recombination in EHEC at the lacZ locus. Cells harboring LacI-expressing pKM208 required prior induction with IPTG for efficient recombination (see below); cells containing pKM201 did not require IPTG addition (due to Ptac leakiness in the absence of over-expressed LacI). In five separate experiments, Red expression from pKM208 produced gene replacements at a rate between 70–600 recombinants per 108 cell survivor (total number of recombinants varied from 750–3000). From one of these experiments, ten out of ten white KanR transformants tested positive for gene replacement by PCR analysis (data not shown). In addition, a PCR fragment containing a lacZ deletion with a cat insertion worked as well as the one described above using kan. It is noteworthy, however, that while the ΔlacZ::kan allele yielded recombinants at a frequency of 0.7–6 × 10-6 per survivor in EHEC containing pKM208, the same PCR fragment in E. coli K-12 containing pKM208 yielded recombinants at a frequency of 10-4 per survivor (data not shown). The sequences used in targeting ΔlacZ to the E. coli K-12 and EHEC chromosomes are identical. The reason for this lower frequency is not known, but may be due to lower expression of red and gam in EHEC, an EHEC-specific restriction system(s), or lower rates of DNA uptake following electroporation. One other possibility for the reduction in efficiency of Red + Gam-promoted PCR-mediated gene replacement in EHEC relative to that seen in E. coli K-12 is that the λ Gam protein might not be as active on EHEC RecBCD as it is for E. coli K-12 RecBCD. This seemed unlikely given the conservation of the recBCD genes between these two species (97–98% conservation). Nonetheless, we made a EHEC Δ recC::cat knockout and tested its ability to perform Red-promoted PCR-mediated recombination. Deactivating RecBCD function by deletion of recC did not stimulate λ Red recombination in EHEC at the lacZ locus (data not shown). Thus, to a first approximation, λ Gam works as efficiently with EHEC RecBCD as it does with E. coli K-12 RecBCD. Another possibility is that the red functions from the endogenous lambdoid EHEC prophage 933 W would be better suited than λ red for gene replacement in EHEC. This seems unlikely given the high degree of conservation between λ and 933 W red genes (99.6% identity), and was not tested. Gene replacements using short homology substrates were also performed in EHEC containing pKM201 at the tir and espF loci within the locus of enterocyte effacement (LEE), though frequencies of gene replacement at these sites (in repeated experiments) were lower than that seen with the lacZ substrate described above, and usually ranged from 0–20 recombinants per 108 survivor. However, this lower frequency of gene replacement at alternative loci relative to lacZ was also observed in E. coli K-12 [unpublished observations]. Thus, the lacZ region may be a hotspot for gene replacement, perhaps the result of stable expression of the drug marker following integration at this particular locus (see below). Nonetheless, Red-promoted PCR-mediated gene replacement was successful with both tir and espF. To assess the overall usefulness of Red-promoted PCR-mediated gene replacement in EHEC, we targeted five O157-specific islands (O-islands) in the EHEC chromosome for deletion; these O-islands are not present in E. coli K-12 . PCR substrates containing the kan gene flanked by 40 base pairs of DNA bordering O-islands #12, #77, #103, #130–131 and #169 (Table 1) were electroporated into EHEC containing pKM208. These islands were targeted because they occupy different regions of the chromosome, are of moderate size (733–4253 base pairs in length), and encode either putative virulence factors or unknown proteins. In the first attempt, all five islands were successfully deleted (see Table 1), though there was variability in the frequency of island replacement. Deletion of O-islands #130–131 (one replacement) occurred at a frequency similar to that seen with lacZ gene (~100 KanR transformants per 108 cell survivors), while the others showed rates ranging from 10–50 fold lower. Thus, λ Red is able to promote efficient short homology recombination with the EHEC chromosome, but with variability according to the target site. a) O157::H7 genetic elements not present in E. coli K-12 b) Genbank accession number AE005174 . c) An estimated 0.25 μg of DNA (3.5 μl) was mixed with 50 μl of electrocompetent EHEC cells and shocked as described in Methods section. Cells were suspended in 3 ml LB following electroporation and grown at 37° for 90 min. Half the culture (1.5 ml) was concentrated by centrifugation and spread on LB plates containing 20 μg/ml kanamycin. In the same experiment, a PCR fragment containing the ΔlacZ::kan allele generated 272 KanR transformants. d) Following 24 h growth, candidates were restreaked on LB-kan plates. Among these KanR candidates, recombinant deletion formation was verified by PCR analysis as described in Methods section (data not show). To determine if any restrictions could be placed on the amount of DNA deleted by Red-promoted recombination, we generated a PCR product containing the cat gene flanked by regions upstream and downstream of an internal section of O-island #148, which contains the locus of enterocyte effacement (LEE). Electroporation with this PCR fragment, designed to delete 9 kb of genes encoding the type III secretion apparatus (see Table 4, strain KC30) generated recombinants at a relatively low frequency of 20 per 108 survivors, similar to the deletion frequencies seen with island #169 above. Thus, both small and large regions of the EHEC chromosome can be deleted in one step using Red-mediated recombination (as has been seen with E. coli K-12). Indeed, an additional 15 islands of EHEC of various sizes up to 45 kb have subsequently been deleted in EHEC by Red-promoted PCR-mediated island replacement using pKM201 [Campellone and Leong, unpublished]. EHEC strains containing the kan substitutions shown in Table 1 were further purified by streaking on LB plates containing 40 μg/ml kanamycin. Interestingly, kan substituted islands #12, #77 and #169, while selected on LB plates containing kanamycin at 20 μg/ml, did not grow at this higher kanamycin concentration (but did restreak well at 20 μg/ml). The other two substitutions (Δisland #103::kan and Δislands #130–131::kan), which consistently gave higher frequencies of gene replacement relative to the others, grew well on LB containing 40 μg/ml kanamycin. These results suggest that the position and/or orientation of the drug cassette within the chromosome alters its expression levels. Thus, the low frequency of O-island #169 replacement (see Table 1) might be due to the influence of neighboring transcripts reading into the kan gene following integration of the Δisland 169::kan PCR substrate into the chromosome, or instability of the kan transcript due to sequences fused to its 3' end. To test this hypothesis, deletion of O-island #169 was repeated using a PCR product that reversed the direction of kan transcription within this chromosomal region. This PCR product was generated with primers Δisland169E & Δisland169F; see Table 6 (Additional file #2). In three separate experiments, we found (on average) 10-fold higher KanR transformants when kan was reading leftward from the position of O-island #169 (according to the numbering in the sequence file) instead of rightward. This leftward reading direction of the kan gene places it colinear with other genes in this region (ytfB and Z5814) and supports the notion that proper positioning of the drug marker in the chromosome can influence the recovery of the recombinant. Unlike E. coli K-12 and Salmonella enterica Serovar Typhimurium, there are no phage transductional protocols for EHEC to place λ Red-generated deletion alleles into clean genetic backgrounds. Thus, it was important to consider the possible mutagenic profile of λ Red expression in EHEC. 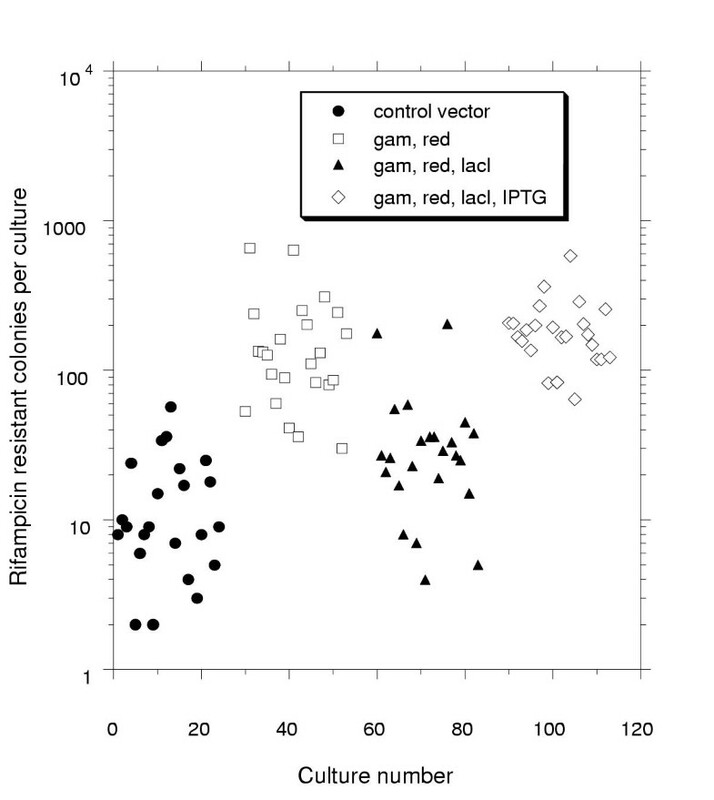 Somewhat surprisingly, overnight cultures of EHEC containing uncontrolled expression of red and gam from pKM201 (which does not express lacI) showed a 10-fold increase in the rate of spontaneous rifampicin resistance (Figure 2). EHEC containing pKM208 (which expresses the lacI repressor as well as the Ptac-red-gam operon) showed a significant increase in rifampicin resistance only when incubated in the presence of IPTG overnight. Uncontrolled λ Red expression is mutagenic. A single fresh colony of EHEC strain TUV93-0 (with indicated plasmids) was suspended in 1 ml LB containing 100 μg/ml ampicillin. The cell suspension was diluted with LB-ampicillin to a final concentration of 5 × 104 cells/ml and aliquoted to 24 culture tubes. Overnight cultures (0.3 ml each) of EHEC with control plasmid (circles), pKM201 (squares), pKM208 (triangles) and pKM208 with IPTG added (diamonds) were plated on LB plates containing 100 μg/ml rifampicin. Plates were incubated overnight at 37 degrees and rifampicin resistant colonies were counted 24 hours later. Average number of RifR colonies (with standard errors) for each culture are as follows: control plasmid, 14.1 (2.7); pKM201, 173 (33.3); pKM208, 40.4 (9.9); pKM208 + IPTG, 194 (21.9). In order to determine the minimum time of Red induction required to generate the hyper-rec phenotype, we measured the frequency of gene replacement as a function of IPTG induction. Figure 3 shows that a 20 minute exposure to IPTG is sufficient to induce the hyper-rec phenotype in EHEC. For most of the experiments reported above, we used a 1 hour IPTG induction period. Thus, we examined if Red induction for 1 hour induced a mutagenic phenotype in EHEC. EHEC cells containing pKM208 were exposed to IPTG for 1 hour in a manner identical that used for the preparation of electrocompetent cells, and plated on LB plates containing rifampicin. No increase in RifR cells was seen in such preparations when compared to uninduced cultures (see Figure 3, insert). Thus, while uncontrolled expression of red and gam causes a 10-fold increase in mutagenesis, limited expression of red and gam required for establishment of the hyper-rec phenotype is not mutagenic, at least with regard to the generation of rifampicin resistant mutants. Time course for promotion of hyper-rec phenotype. EHEC strain TUV93-0 containing pKM208 (five cultures, 20 ml each) was grown for electrocompetence as described in the Methods section. At various times prior to collection, IPTG was added to four of the cultures to a final concentration of 1 mM; the fifth culture received no IPTG. The cells were heat shocked for the final 15 minutes, prepared for electroporation and electroporated with DNA (~0.25 μg) containing the kan gene flanked by 40 bp of EHEC DNA (resulting in a deletion of O-islands #130 and #131). After suspension in LB, the cells were grown for 90 minutes at 37°C and plated on LB plates containing 20 μg/ml kanamycin. The number of KanR transformants per 108 survivor and total number of KanR transformants are plotted as a function of IPTG concentration. The data points are averages of two experiments (ranges are shown). A random check of 160 colonies showed that 95% re-struck successfully to fresh LB plates containing 20 μg/ml kanamycin; 10 of 10 of these colonies were verified by PCR analysis to be true recombinants (data not shown). Insert: 0.1 ml of electrocompetent cells, prepared with and without 1 hour IPTG induction, were spread on LB plates containing 100 μg/ml rifampicin to determine total number of RifR mutants. Dilutions of the cells were titered on LB plates to determine total cell density; experiments done in triplicate (+/- standard error). Red and Gam-producing plasmid pKD46 has been reported for use in long homology recombination of plasmids with the EPEC chromosome, but not short homology PCR-mediated recombination. We decided to test our plasmids in EPEC for Red-promoted PCR-mediated recombination. Despite repeated attempts, we were not able to transform EPEC with either of the pSC101-origin containing plasmids pKM201 or pKM208. We, as yet, do not know the reason for this result. However, we were able to electroporate EPEC with pTP223. Surprisingly, and unlike the case with EHEC, pTP223 did promote efficient short homology recombination with PCR substrates. We have used this plasmid to construct an EPECΔtir construct (the details of the construction of this strain have been described previously ). We have also constructed a 13 kb deletion within the locus of enterocyte effacement in EPEC (KC21) in a manner similar to that described above for EHEC (described in Table 4), with the exception that pTP223 was used to supply Red and Gam. Also, we find that the heat shock step plays a stimulatory role in Red-promoted PCR-mediated EPEC gene replacement. In one set of experiments, the heat shock step with EPEC resulted in 2–10 fold increase in the number of recombinants (corresponding to a 20–100 fold increase in frequency of recombinants per survivor of electroporation). The effect of the heat shock step is quite variable, however, as we found the stimulation of recombinants per survivor using the Δlac::kan allele in EHEC to be only 2–4 fold. While λ Red-promoted recombination with PCR-generated substrates offers the simplest mechanism for generating gene knockouts, there are other times when using long homology-containing plasmid substrates are advantageous. For instance, when multiple mutant alleles of a target gene need to be crossed into the chromosome, it is desirable to have the substrate previously cloned, in order to not induce PCR errors into the allele prior to transfer to the chromosome. A dedicated plasmid containing sequenced regions upstream and downstream regions of the target gene is required. Also, long homology-containing substrates promote higher frequencies of gene replacement relative to short homology substrates, and offer higher success rates for Red-promoted gene replacement in pathogenic hosts that are not as electrocompetent as E. coli K-12. Thus, we examined a variety of plasmid-derived substrates to test Red-promoted knockouts of eae, tir and the tir-cesT-eae region in the EHEC chromosome. The product of the eae gene, intimin, is an outer membrane protein that is necessary for attachment to the target cell. The receptor for intimin, Tir (translocated intimin receptor), is a bacterial protein that is translocated into the host cell membrane by the LEE-encoded type III secretion system. cesT encodes a chaperone for Tir [see reference  for review]. Plasmid substrates were constructed that contained the cat gene (conferring resistance to chloramphenicol) flanked by upstream and downstream regions of tir, eae, or the tir-cesT-eae operon. Linear DNA recombination substrates (i.e., the cat gene flanked by 1.5 kb of target DNA) were generated from these plasmids by digestion with restriction enzymes(see Tables 4 & 5 for details). EHEC cells harboring pTP223 were electroporated with the restriction digests, or gel-purified linear fragments containing the marked deletions, and plated on LB plates containing chloramphenicol. Among the chloramphenicol resistant colonies, potential chromosomal substitutions were distinguished from simple plasmid transformants by their sensitivity to ampicillin (bla gene carried within the pUC19 plasmid backbone). Results of a number of these experiments are shown in Table 2. In all cases, Δeae, Δtir, or Δeae-cesT-tir was easily generated with these plasmid substrates, generating as few as 2 and as many as 1000 gene replacements per experiment, depending on the nature and amount of the transforming DNA. These genes were replaced with either the cat drug marker (Table 2, lines 1, 2, 4–9) or a cat-sacB cassette (Table 2, lines 3, 10 and 11). The latter substitutions generated strains that were subsequently used to generate in-frame, precise deletions (see Table 3). Gene replacements were verified by PCR analysis on all selected candidates (1–6) in each experiment, using oligo primers within and outside the regions of the linear DNA substrates (data not shown). Overall, the following observations were evident: Electroporation of simple plasmid digests resulted in a high number of non recombinogenic plasmid transformants (i.e., CamR-AmpR, see Table 2, lines 1–3), due to incomplete digestion or religation of the plasmid substrate in vivo. A higher number of potential gene replacement transformants (i.e., CamR-AmpS colonies) could be obtained by further digestion of the plasmid with a backbone-specific restriction enzyme, ApaL I (see Table 2, lines 4–7), or by gel purification of the linear DNA recombination substrate (Table 2, lines 8–11). Interestingly, the Red-producing plasmid pTP223 is spontaneously lost during this process (between 10–50% of the transformants are TetS). Thus, fortuitously, a separate step to cure the recombinant of the Red plasmid is not required. These experiments show that marked and precise deletions can be easily generated in EHEC without the need to form and resolve plasmid co-integrates. We have used this procedure recently to generate deletions at the recC and dam loci in EHEC (experiments to be described elsewhere). a) The selection for SucR-CamS transformants (containing precise in-frame deletions) was performed as described previously for E. coli K-12 . The drug marker context effect seen above with construction of the Δisland #169 deletion using PCR substrates was also seen with one of the long homology substrates. Initial attempts to generate the EHEC chromosomal replacement Δeae::cat using SacI-SphI fragment from pKM184 yielded no recombinants with repeated attempts. The orientation of the cat gene inserted within the eae flanking regions of pKM184 was determined, and found to be reading opposite to the direction of the endogenous eae gene. Thus, a version of pKM184 was constructed where the cat gene was inserted co-directionally with eae. Electroporation with this substrate readily yielded recombinants (see Table 2, lines 1, 4–5). Thus again, we find that the orientation of the drug marker within the target gene site can alter either its expression level (preventing the selection of the recombinant) or its ability to be stably incorporated into the chromosome. With difficult substitutions, both orientations of the drug marker (or the use of properly positioned transcription terminators within the plasmid construct) should be attempted. Context dependent marker expression may be one of the primary causes of the variation seen among Red-promoted gene replacements of the same drug marker placed at different loci along the E. coli K-12 and Salmonella enterica Serovar typhimurium chromosomes [unpublished observations; S. Maloy, personal communication]. The ability to inactivate or replace a gene of interest in the chromosomes of bacterial pathogens is a critical step in the identification of virulence factors, and in the elucidation of mechanisms of infectivity. However, gene replacement protocols for most pathogenic bacteria prove difficult and time consuming. The success of the λ Red bacteriophage recombination system to promote gene replacement in E. coli K-12 and Salmonella enterica Serovar Typhimurium suggested that this system should work well in pathogenic species of E. coli. We have shown here that λ Red can be efficiently utilized for the manipulation of the chromosomes of EHEC and EPEC. Using protocols described here, we have found that five out of five O-islands in EHEC were successfully knocked-out and replaced with the kanamycin resistance gene. The versatility of the Red system in EHEC is highlighted here by the range of chromosomal segments that can be deleted; Red deleted pathogenicity islands as small as 733 bp and as large as 45 kb. In addition, the Red-producing plasmids described here, (including pTP223 which does not have a temperature sensitive origin of replication) are unstable following induction with IPTG (10–50% of the transformants lose the plasmid). This is rather a fortuitous result, as gene replacement and plasmid curing occurs simultaneously after electroporation, and such transformants can be found by screening. Transformants cured of the plasmid and modified at the gene of interest are readily available for in vitro and in vivo analyses. We found that λ Red and Gam work less efficiently in EHEC relative to E. coli K-12 (as judged by recombination in the lacZ locus). Despite this lower frequency, λ Red works at an efficiency that appears to allow any non-essential regions of the chromosome to be manipulated. This is true for EPEC as well when red and gam are expressed from plasmid pTP223. It is curious that pTP223 works well in EPEC, but not in EHEC or E. coli K-12 for PCR-mediated Red recombination. Perhaps in EPEC, pTP223 does not replicate by extensive rolling-circle replication as was seen for E. coli K-12, thus preventing linear multimers of the plasmid from interfering with Red function. This hypothesis, however, has not been tested. Another interesting observation reported here is the mutagenic phenotype of constitutive red overexpression. One possibility for this effect could be that the annealing function of Bet interferes with mismatch repair pathway of E. coli by reannealing the unwound ssDNA generated by UvrD, thus interfering with the progression of the mismatch repair process. The mutagenic phenotype of constitutive Red expression (and possibly RecET as well) highlights the importance of controlling these functions in vivo when using them for gene replacement in pathogenic bacteria (i.e., limiting their expression to a recombinogenic window). The mutagenesis associated with Red may explain why many bacterial species don't possess a constitutive phage-like recombination system as their primary recombination pathway, and instead employ the more discriminating Chi-activated RecBCD dsDNA exonuclease to generate recombinant intermediates (a pathway that doesn't involve a known Bet-like ssDNA annealing protein). The plasmids and procedures described here have recently been used to make gene replacements in enteroaggregative E. coli, using both long and short homology substrates (Edward Dudley, personal communication). We are currently attempting to adapt the λ Red recombination system for use in Pseudomonas aeruginosa, and other bacterial pathogens. Though not yet verified, EHEC and EPEC containing Red and Gam-producing plasmids may also be amenable to ssDNA oligo-directed chromosomal alterations and in vivo cloning by gap repair, as has been demonstrated with E. coli K-12 strains expressing phage recombination functions [31–33]. Clearly, if the chromosomes of pathogenic organisms could be manipulated with the ease with which we now do gene replacement in E. coli, it would be a dramatic development for the analysis of bacterial pathogenic mechanisms. This is especially true now that genomes of clinically relevant bacteria are being sequenced, and thousands of new genes are at our disposal for genetic analysis. Strains used and generated in this study are listed in Table 4. The strain KC5 (EHECΔtir) has been previously cited ; its construction is described here. Plasmids pKM154, pTP550, pTP223, pTP806, and pTP826 have been previously described [3, 34–36]. pAMPts (5.2 kb), an ampicillin derivative of pMAK705 , was constructed by Greg Phillips (Iowa State University) and was a gift from Paul Danese (Harvard). A CamR version of pKM201 (pKM200) was also constructed and behaves similarly to pKM201. Plasmids constructed for this study are described in Table 5 (see Additional file 1). The primers used in this study are listed in Table 6 (see Additional file 2). Those used for the construction of plasmids for long homology substrates are named according to the convention used in reference ; U (upstream), N (N-terminal encoding region), C (C-terminal encoding region) and D (downstream) of the target gene(s). The primers used for the construction of PCR-generated (small homology) substrates are designated as follows: 5KO (primer sequence anneals to 5' region of target gene(s), 3 KO (primer sequence anneals to 3' region of target gene(s), H (EHEC), P (EPEC). For EHEC island deletions, primer pairs A and B were used to generate PCR recombinant fragment with kan reading rightward relative to the published sequence; primer pairs E and F were used to generate PCR recombinant fragments with kan reading leftward relative to the published sequence. A single fresh colony of EHEC or EPEC was placed into 20 ml of LB plus 15 μg/ml tetracycline (for pTP223) or 100 μg/ml ampicillin (for pKM201 and pKM208) and shaken at 30°C in an 125 ml flask. At a concentration of ~107 cells/ml, IPTG was added to a final concentration of 1 mM. When the culture reached a density of 0.5 – 1 × 108, the cells were heat shocked for 15 minutes by swirling at 42°C, transferred to an ice-water bath for 10 min with swirling, then collected by centrifugation. The cells were resuspended in 1 ml of ice-cold 20% glycerol - 1 mM MOPS (unbuffered), transferred to a 1.5 ml sterile eppendorf tube, and spun in a microfuge for 30 seconds (moderate speed). The supernatant was removed; the cells were resuspended in 1 ml of the same buffer and recentrifuged. This step was repeated and the cells were finally resuspended in 90–100 μl of ice-cold 20% glycerol - 1 mM MOPS. Electroporation cuvettes (Biorad) were cooled in an ice-water bath for at least 10 minutes prior to use. DNA samples contained either 0.1 – 0.5 μg of purified DNA fragments or 0.2 – 10.0 μg of plasmid digests in TE or water. A 50 μl sample of cells was mixed with 1–5 μl of DNA, transferred to the electroporation cuvette, and incubated on ice for 1 minute. The cuvette was thoroughly but quickly dried and the cells were shocked as described previously . Following electroporation, the cells were recovered by suspension in 0.3 ml LB, diluted into 2.7 ml LB, grown by rolling at 37° for 1.5 hour, and plated on LB plates containing either 10–15 μg/ml chloramphenicol or 20 μg/ml kanamycin. 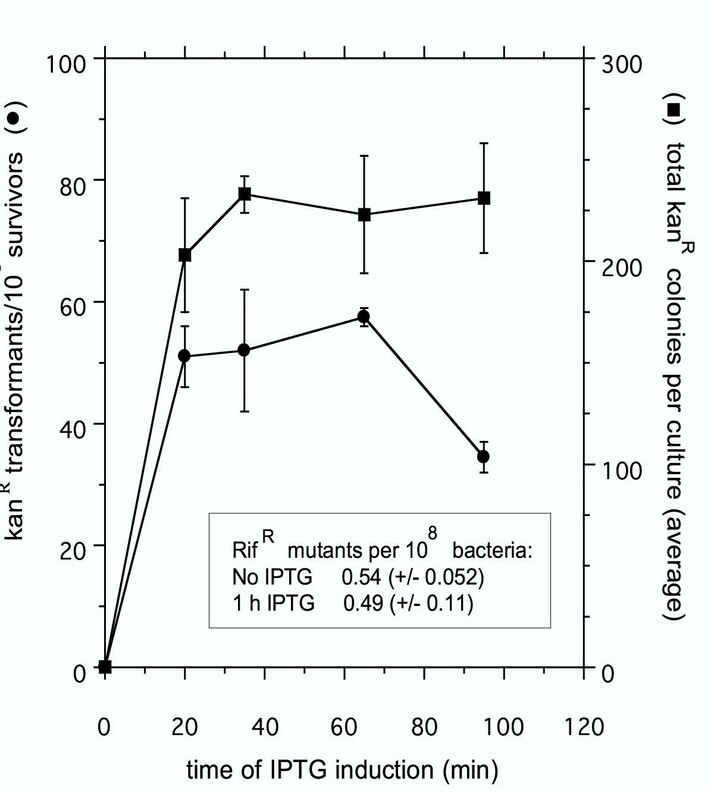 (Growing for less that one hour with kanamycin markers drastically reduced the recovery of recombinants). Alternatively, though usually not required, the cell cultures were grown overnight before plating. After overnight growth, drug-resistant transformants of EHEC and EPEC were restreaked on LB plates containing the appropriate drug. In some of the early experiments, ice-cold water was used instead of 20% glycerol - 1 mM MOPS for resuspending the cells. However, we found the glycerol/MOPS buffer improved the electroporation survivor rate for EHEC (and thus recovery of recombinants), as was reported for electroporation of Pseudomonas aeruginosa . In some experiments, transformants were also checked for tetracycline (pTP223) or ampicillin (pKM201 and pKM208) sensitivity indicating loss of the Red-producing plasmid (if desired). These Red-producing plasmids were lost spontaneously at relatively high frequency following growth and electroporation, i.e., selection at 42 degrees for loss of the temp-sensitive pKM208 replicon was usually not required. Various numbers of transformants that successfully restreaked on to fresh drug plates were analyzed by PCR to verify chromosomal replacement of the target gene(s). Gene replacements involving short homology PCR substrates were verified by using primers outside the region of the chromosome being replaced, while verification of gene replacements made with plasmid-derived substrates contained one primer outside the flanking homologous region and the other primer within the drug marker. The sequence of the primers used for verifying Red-promoted gene replacements listed in Tables 1, 2, 3 are available upon request. The selection for SucR-CamS transformants (containing precise in-frame deletions) was done as described previously for E. coli K-12 . We thank John Leong for material support and helpful discussions and Pamela Savage for construction of recombinant plasmids. This work was supported by a grant from the National Institutes of Health (NIH-R21-GM62482) to K.C.M. This publication's content are solely the responsibility of the authors and do not necessarily represent the official views of the National Institutes of Health. K.G.C. constructed the PCR-mediated gene replacements Δtir::cat, ΔespF::cat, and ΔLEE::cat in EHEC, generated the Δtir clean deletion using long homology recombination, and performed the heat shock experiments that led to the construction of the ΔLEE::cat replacement allele in EPEC. K.C.M. constructed all other deletions, performed the experiments of Figures 2 &3, provided supervision and wrote the paper.